RICHMOND, VA—GPM Investments, LLC announced that its 2016 MDA Holiday Fundraising Program raised over $190,000 to help liberate children and adults from the harm of muscular dystrophy, ALS and related muscle-debilitating diseases. For the entire month of December, more than 700 GPM convenience stores throughout the East Coast and Midwest, including Fas Mart®, Shore Stop®, Scotchman®, Village Pantry®, Apple Market, BreadBox, Li’l Cricket, Next Door Store, Young’s, and their customers, participated in a fundraising program in which customers purchased paper pinups for $1 to help find treatments and cures for muscular dystrophy, ALS and other neuromuscular diseases. 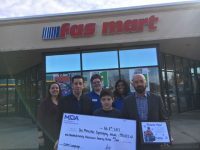 Each pinup purchased by these generous customers was prominently displayed at the participating stores to symbolize strength, independence and life for MDA families in the community. 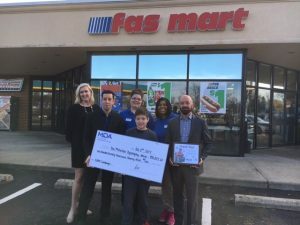 GPM executives Arie Kotler, President and Chief Executive Officer, and Chris Giacobone, Chief Operating Officer, presented the generous check of $190,023 together at an area Fas Mart® convenience store to an MDA Goodwill Ambassador. 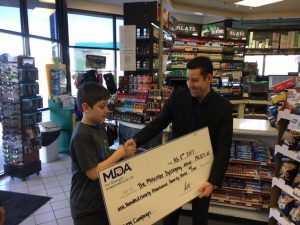 Funds raised this year made MDA Summer Camp possible for more than 90 children where they can experience the best week of the year and at no cost to their families. GPM Investments, LLC, together with its subsidiaries, is the largest privately-owned company in the convenience store channel of business. With the planned addition of Roadrunner Market stores in Q2 2017, GPM will widen its reach to more than 1,100 stores. The company, based in Richmond, VA, operates or supplies fuel to stores in Connecticut, Delaware, Illinois, Indiana, Iowa, Kentucky, Maryland, Michigan, Missouri, Nebraska, New Jersey, North Carolina, Ohio, Pennsylvania, Rhode Island, South Carolina, Tennessee and Virginia. Their stores offer specialty coffee and cappuccino, innovative beverage programs, a large selection of grocery items, such as fresh fruit, an exclusive E-vapors® line, and many other products to suit the needs of every customer. One feature, setting many of its convenience stores apart, is a wide array of proprietary food offerings ranging from fresh-made salads and sandwiches to healthy, grab-and-go meals. Visit www.gpminvestments.com to learn more about their stores.